What better way can you show your pet how much you love them than to invest in their health? Help Protect and/or Heal your Pet for Life! Here at Winding Creek Ranch, we have made the decision to keep all of our own dogs on NuVet Plus because we feel it is an exceptional supplement with vital ingredients. Our babies get very excited, as they see this as "treat time!" Also, we feel so good about the fact that we aren't giving them an empty treat but rather, something we know is building their immune systems and lengthening their life spans. 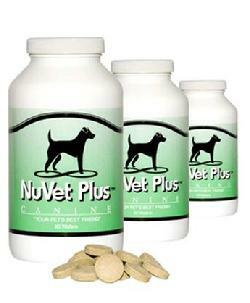 When we opened our first shipment of NuVet Plus, we were amazed at the aroma which is a true testimony to the freshness and quality of this product. You just have to see (or smell) for yourself! Here at Winding Creek Ranch, we know that healthy dogs produce healthy puppies. We also know, you will want to keep your puppy healthy for it's entire life. Even if your dog has never taken NuVet Plus or you thought your pup didn't need it anymore, it's never too late to start giving your dog the benefit or this immune building supplement! If joint issues are a concern, there is also a product called NuJoint Plus. Our puppies will go to their new homes already receiving this wonderful supplement. It is up to you to continue this supplement for your special friend. We feel this is the best "pet insurance" out there. We would rather prevent issues than wait for them to happen and try to treat them. Besides, life span is very important to all of us. We all want our special furry friend to live forever. That may not be a feasible expectation but we know we are doing what we can to help keep them healthy and with us for as long as possible. We feed a high quality food here as Winding Creek Ranch but we know that even the best foods on the market do not include these amazing INGREDIENTS. This is NOT just a vitamin. If it were, there would be a lot more competition on the market. If that were the case, we probably would not be using it or recommending it. We feel this product is far superior to anything found on the store shelves. There is a reason why some veterinarians have started recommending it and even prescribing it to their clients! It's awesome as a preventative but also works as a treatment (although you may have to give double the maintenenace amount for treatment purposes). We know we make a great argument but we'd like to invite you to read the testimonials and additional info on the NuVet website. If you are already planning to get a puppy from us, you will receive an email from us, about 2 wks prior to taking your puppy home, with instructions on ordering it for your puppy. Since your puppy began receiving benefits while in the womb, through nursing and has been receiving this each day since able to eat food, we know you'll want to continue giving NuVet Plus to your puppy as part of our "Best Chance at Life" regimen. See also, the Doggie Diet 101 page to learn about the awesome food our dogs get to eat! and for making your pet's health a top priority. GUARANTEED - No sugars or fillers. ***Our team of Veterinarians, Physicians, Pharmacists and Nutritional Scientists took eight years to develop this revolutionary product. On the market for over 13 years, we're one of the oldest US pet supplement companies.